A pitched percussion instrument is a percussion instrument used to produce musical notes of one or more pitches, as opposed to an unpitched percussion instrument which is used to produce sounds of indefinite pitch. Pitching of percussion instruments is achieved through a variety of means. Membranophones are tuned by altering the surface tension of the face that is struck. 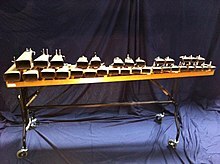 Mallet percussion instruments gain their pitch through physical characteristics such as composition, density, or physical dimensions of each respective note. Alternatively, other percussion instruments can gain pitch through variation of air volume displaced. Many untuned percussion instruments, such as the snare drum, are tuned by the player, but this tuning does not relate to a particular pitch. Untuned percussion instruments can and frequently do make sounds that could be used as pitched notes in an appropriate context. Some percussion instruments, such as the timpani and glockenspiel, are almost always used as pitched percussion. Some percussion instruments, and particularly many types of bell and closely related instruments, are sometimes used as pitched percussion, and at other times as unpitched percussion. Some percussion instruments, such as the snare drum, are almost always used as unpitched percussion. Mallet percussion, instruments such as the glockenspiel and chime bars, played in a particular way. Keyboard percussion, instruments such as the glockenspiel and tubular bells arranged in a particular way (but not including the celesta and other keyboard instruments despite the name). Melodic percussion, instruments used to produce several different pitches. This page was last edited on 1 January 2019, at 01:58 (UTC).